A color commentator or expert commentator is a sports commentator who assists the main commentator, often by filling in any time when play is not in progress. The phrase "color commentator" is primarily used in American English; the concept may also be referred to as a summariser (outside North America) or analyst (a term used throughout the English-speaking world). The color analyst and main commentator will often exchange comments freely throughout the broadcast, when the main commentator is not describing the action. The color commentator provides expert analysis and background information, such as statistics, strategy, and injury reports on the teams and athletes, and occasionally anecdotes or light humor. Color commentators are often former athletes or coaches of the sport being broadcast. The term color refers to levity and insight provided by a secondary announcer. A sports color commentator customarily works alongside the play-by-play broadcaster. Commentary teams typically feature one professional commentator describing the passage of play, and another, usually a former player or coach, providing supplementary input as the game progresses. The color commentator will usually restrict his input to periods when the ball or puck is out of play or there is no significant action on the field and will defer to the main commentator whenever there is a shot on goal or other significant event, sometimes resulting in their being talked-over or cut short by the primary commentator. Additionally, former players and managers appear as pundits, carrying out a similar role to the co-commentator during the pre-game show preceding a given contest and the post-game show following it. In American motorsports coverage, there may be as many as two color commentators in the booth for a given broadcast. A rules analyst, typically a former official, may comment on rules enforcement and replays. In the past, American sports broadcasts often employed three-man booths, with two color commentators, one who is a former player or coach, and the other with a journalism or entertainment background; Monday Night Football was famous for this format, employing Howard Cosell as their "outsider" commentator for over a decade and later hiring comedian Dennis Miller and then newspaper columnist Tony Kornheiser for the same position. WWE is a primary example of the three-man booth, with main commentator Michael Cole and two color commentators, Corey Graves and Renee Young, on the flagship show WWE Raw. In the United Kingdom, the role of "color commentator" is largely unknown; the equivalent role is usually called "summariser" but also known as "analyst", "pundit", or simply "co-commentator". Cricket coverage on ESPNcricinfo uses similar terminology. The term is not used in Australia. Those giving the analysis alongside the main commentator are sometimes said to be giving additional or expert analysis, or "special comments", or may be referred to as "expert commentators". For football broadcasts on Latin American sports television channels, this type of commentator is called a comentarista in both Spanish and Portuguese, in contrast with the narrador, locutor (Portuguese) or relator (Spanish) who leads the transmission. There is no mention or translation to the term "color". In Denmark, Norway and Sweden the position is known as ekspertkommentator / expertkommentator (expert commentator), whereas the play-by-play announcer is called hovedkommentator / huvudkommentator (head commentator) or simply kommentator. In Spanish and Portuguese-speaking countries, the position is known as a comentarista and comentador (commentator; comentarista in Brazilian Portuguese), respectively, in contrast with the narrador (narrator) who describes the action. Similarly, in Finland kommentaattori is used for the second commentator, and selostaja (explainer) for the main one. In France, the term for a color commentator is consultant, as opposed to the commentateur sportif (who is also a journalist). In Italy, the color commentator is usually referred to as responsible for the commento tecnico (technical comment) whereas the play-by-play commentator is the main telecronista. In Italy, too, the color commentator is usually a person formerly directly involved in the sport (as an athlete/player/pilot or as a coach). Recent Formula 1 races have no fewer than three commentators: the telecronista, a former pilot, and an engineer, the last two sharing the commento tecnico. In Turkey, the term spiker is used for the play-by-play announcer whereas the color commentator is referred to simply as yorumcu (commentator). In some countries, the two-person commentating team is not used as much as elsewhere. 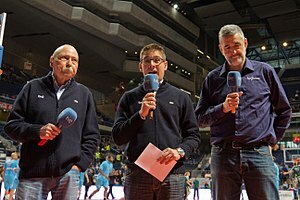 In Germany, most broadcasts of sports matches traditionally feature a single play-by-play announcer who also provides commentary, background information, and statistics. If the broadcast is on TV, the announcer will usually not comment on visually obvious things. A two-person commentating team is used more often for sports where understanding of events depends more on details and subtle visual cues that not everybody might instantly get or might need extra information in order to reasonably understand – for example in auto racing or winter sport. In those cases, a current or former athlete or coach is often used as co-commentator or Experte (expert). Though not always the case, in professional wrestling, the color commentator is usually a "heel sympathizer" (or a supporter of the "bad guys") as opposed to the play-by-play announcer, who is more or less the "voice of the fans" as well as supporters of the "good guys" (or babyfaces). Though both are supposed to show neutral stance while announcing, the color commentators (especially when they support heels) are usually more blatant about their stance than the play-by-play announcers. Jesse "The Body" Ventura and Bobby "The Brain" Heenan pioneered the "heel sympathizer" for color commentary in wrestling. Jerry "The King" Lawler later made a successful transition into the role, though Lawler has since shown more sympathy for faces (partially due to being over with fans after nearly forty years in wrestling). In some cases, commentators are also active managers for wrestlers, usually following continuity as heels. Former Extreme Championship Wrestling color commentator Cyrus was known for having dual roles as a heel manager and a somewhat neutral commentator. It has also been used to keep injured wrestlers in the public eye while they recuperate. Special guest color commentators serve a twofold purpose, the primary is usually to place them in position to interfere with the match they are calling, but also serves to tell the promotors if this performer can "talk" on his own in the ad lib driven commentary role. ^ "Color commentator | Define Color commentator at Dictionary.com". Dictionary.reference.com. Retrieved 2014-02-03. ^ a b "What Is a Color Commentator? | Everyday Life - Global Post". Everydaylife.globalpost.com. Retrieved 2014-02-03. ^ "What Is a Color Commentator? | Chron.com". Work.chron.com. 2010-11-29. Retrieved 2014-02-03. ^ "Announcers : Occupational Outlook Handbook : U.S. Bureau of Labor Statistics". Bls.gov. 2014-01-08. Retrieved 2014-02-03. ^ "Color Commentary and Play by Play: A Well-Rounded Approach to Facebook". Inkling Media. 2012-05-02. Archived from the original on 2014-01-16. Retrieved 2014-02-03. ^ "The Sportscaster: A Brief History & Job Description". Americansportscastersonline.com. 2014-01-07. Retrieved 2014-02-03. ^ "The Top Three Keys For Becoming a Color Commentator | Sportsideo.com member John Lund". Sportsideo.com. 2012-11-27. Archived from the original on 2014-01-16. Retrieved 2014-02-03. ^ Kedzie, Julie (2013-07-18). "Julie Kedzie Breaks Down the Art of MMA Color Commentary | FIGHTLAND". Fightland.vice.com. Retrieved 2014-02-03. ^ McCarthy, Michael (2016-09-06). "Fox NFL rules analyst Mike Pereira is lethal 'weapon' rival networks don't have". Sporting News. Retrieved 2018-01-09. ^ Raissman, Bob (2017-12-23). "Tony Romo shows he has much to learn after clueless Steelers call". NY Daily News. Retrieved 2018-01-09.